I feel like a part of my mind is lying dormant while I wait for my camera to be repaired. Also, I just read a pile of new articles about music and the brain, and clearly others parts of my brain aren’t getting as much use while my choir is on hiatus. I took the shot below while in Boston researching composers Randall Thompson and Francis Boott. Every time I go to Boston I have to walk around Cambridge and Harvard Yard, visiting all my old haunts and the places where I once lived. It’s a nostalgia-wallowing thing that I have always done. This motorcycle was parked in front of my old apartment. F _ _ _ K you! 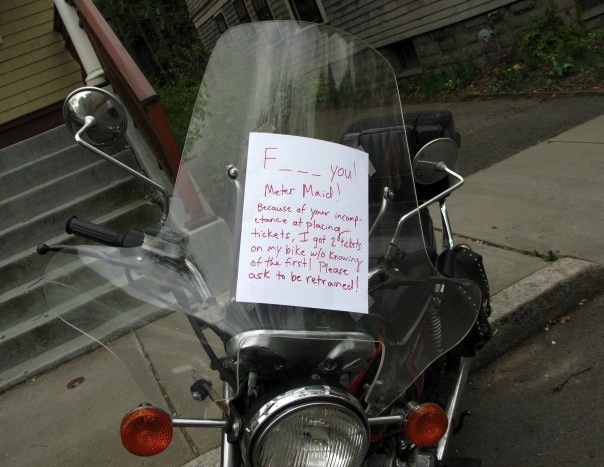 It’s pretty well-mannered for an angry note. It would have been nice if there’d been a scribbled in, “I’m sorry,” in a different hand writing. I hope you gave a little aloha wave to the Dewey, Cheathem and Howe sign in the upper iwndow just off Hatrvard Square. The Car Talk guys, Click and Clack are calling it quits after something like 25 years on NPR. Fond memories of Cambridge here, too. Oh, I don’t listen to that show, didn’t even know they were based in Harvard Square! Yeah, when you don’t have a car the interest goes down. But they’re a lot of fun. Especially the adolescent humor.